Looking to cut energy costs and improve home comfort? Focus on your heating and cooling systems. While it is imperative to choose an Energy Star-certified unit properly sized for your home, a variety of factors influence the effectiveness of your system, according to the experts at Lennox. And some of those factors, it turns out, have very little to do with areas of the home that you actually live in. Your attic is the primary buffer zone between the conditioned air of your home and the roof that shields your dwelling from the elements. If your attic is not properly insulated and ventilated, then your home may be losing heat in the winter and cool air in summer. As a result, your furnace and air conditioning units may be working harder than necessary to maintain a comfortable indoor temperature. Proper attic insulation is key to ensuring that you pay no more than necessary to run your HVAC equipment. 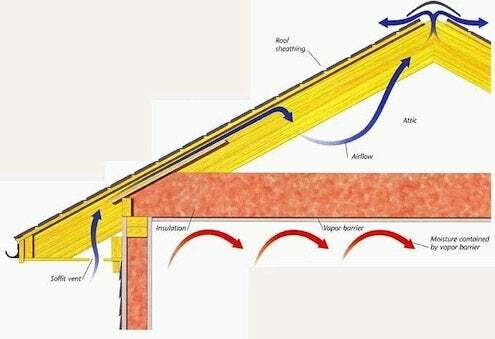 Requirements vary by region, but for most attics, the recommended R-value is up to R-38, or about ten to 14 inches, depending on insulation type. Insulation alone won’t do the trick. Attic ventilation also plays an important role in optimizing your home’s heating and cooling performance. In winter, a natural flow of outdoor air helps the attic stay cool, reducing the risk of ice dams and related roof damage. In summer, the same ventilation—in some cases aided by an attic fan—helps usher out superheated air, reducing its burden on air conditioning. Take note: One of the biggest mistakes that homeowners make when installing insulation is blocking the flow of air at the eaves. Not only does this compromise the insulation’s effectiveness in winter, but also, the combination of blocked vents, poor insulation, and an operational attic fan could mean you’re paying to air-condition the attic—something you certainly don’t want to do! The condition of your crawl space also impacts the overall efficiency of your heating and cooling system. Years ago, it was common practice to insulate the floor above the crawl space and to keep the wall vents open so that any moisture buildup would vent to the outside. Particularly in climates with humid summers, the reality was that vents actually allowed moisture in, and that moisture would eventually degrade the crawl space’s insulation. Energy experts today advise that crawl spaces be included in a home’s conditioned space. That way, condensation is eliminated, energy loss from air ducts is reduced, and in winter, thanks to drafts being prevented, first-level floors remain warmer. This post has been brought to you by Lennox. Its facts and opinions are those of BobVila.com.